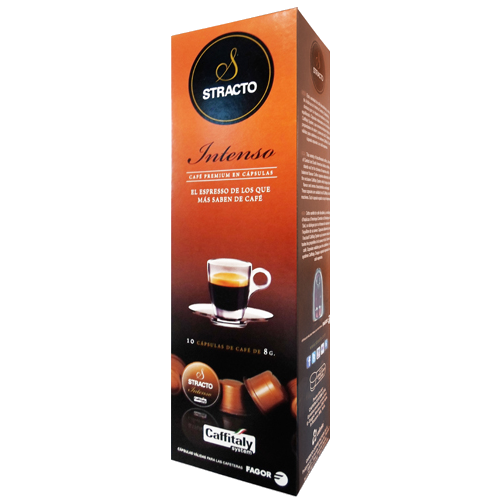 Stracto Intenso Caffitaly is a soft blend of Arabica beans from Brazil, Nicaragua and Colombia. Mild round soft is a fitting description. These capsules are made of Spain's perhaps best coffee roaster Cafento which has been roasting coffee since 1939. They currently have three production plants, of which one is normally not in operation, but only serves as a backup if something happens to any of the others. Stracto is just one of the many brands it owns and uses. We will eventually bring in more products from their huge product range. The Spanish espresso coffee is somewhat reminiscent of the Italian but often have a bigger body and more pronounced character, they use a lot of beans from South America. Enjoy a cup and feel like you're sitting in one of Spain's charming cafés.